Shipments can be traced immediately by entering specific Pro Bill, PO or BOL numbers. They can also be found by entering a combination of known search criteria. * Enter up to 20 numbers, each separated by a comma. * For Pro bill# enter numbers only, without spaces. * For trailer/container tracking use Advanced Search. The data retrieved from your search will be returned in a summary list format with all pertinent elements tabled. Key information, such as shipment status, may be available at a glance. For a more in-depth view, detail on particular shipments may be obtained by clicking on the appropriate hyperlinked Pro Bill#. 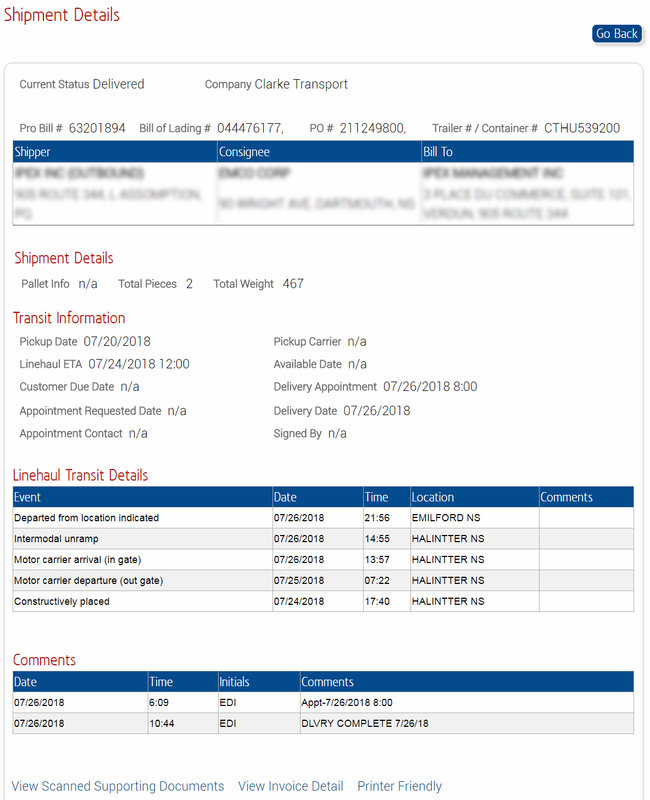 Review up to date information on shipments as well as recent shipment history to answer your users' inquiries immediately. A selection of options, such as viewing associated scanned documents and related invoices, are provided to allow the user to verify information immediately.